Hamburg, March 2019 - With Ellon and Festmoker, Pack & Smooch is expanding its range of useful accessories made of particularly high-quality leather. It is purely vegetable tanned and comes from Italian family businesses. The special highlight is the embossing. Ellon lanyard can be customised in blind embossing, gold or silver and offers space for up to ten characters. The embossed anchor on Festmoker underlines the Hanseatic origin of the key case. Also still available is the particularly narrow Kingsley key case, which can also be embossed with a personal touch. Festmoker does not only bring sea bears, dike counts or Hamburg fans into the day - too German: Festmacher - a fresh breeze. Like all Pack & Smooch accessories, the slim bunch of keys is handmade in the Hanseatic city. And you can see that: the embossed anchor is proudly emblazoned on the front. The sturdy ring eye holds up to six keys, quality push buttons from Prym guarantee easy opening and closing as well as a long service life of the product. 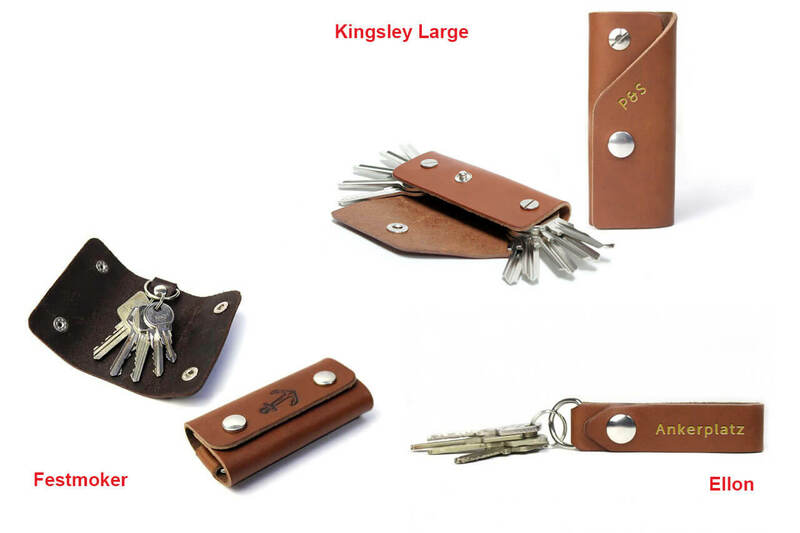 The solid anchorage for keys is available in either light or dark brown natural leather. The key ring Ellon is also handmade. The used two mm thick natural leather guarantees high stability. With the extra strong ring spring push button, Ellon can be securely fastened to the belt or in a pocket. The practical accessory is available in dark brown or light brown. And even if all residents choose the same colour, there is no mess on the key board: the loop can be individualised with up to ten characters. It's already a Pack & Smooch classic: the Kingsley key case offers up to ten keys a slim home. Particularly practical: the strong envelope turns a bulky bunch of keys into a flat pack that won't even stick in your pocket. Kingsley is available in light or dark brown. It can be embossed with initials of up to three characters. All accessories can be ordered in the Pack & Smooch online shop. Key ring Ellon costs 16,90 Euro. Embossing of up to ten characters is charged at an additional eight euros. Key case Festmoker costs 24.90 Euro. The RRP for key case Kingsley is 24.90 euros, the embossing for up to three characters costs eight euros extra.